This is a translated and expanded version of what I wrote in 2010 and in 2013. Martertod des Hl. Thomas von Canterbury by Master Francke (c.1380-c.1440), painted c.1424-1436. 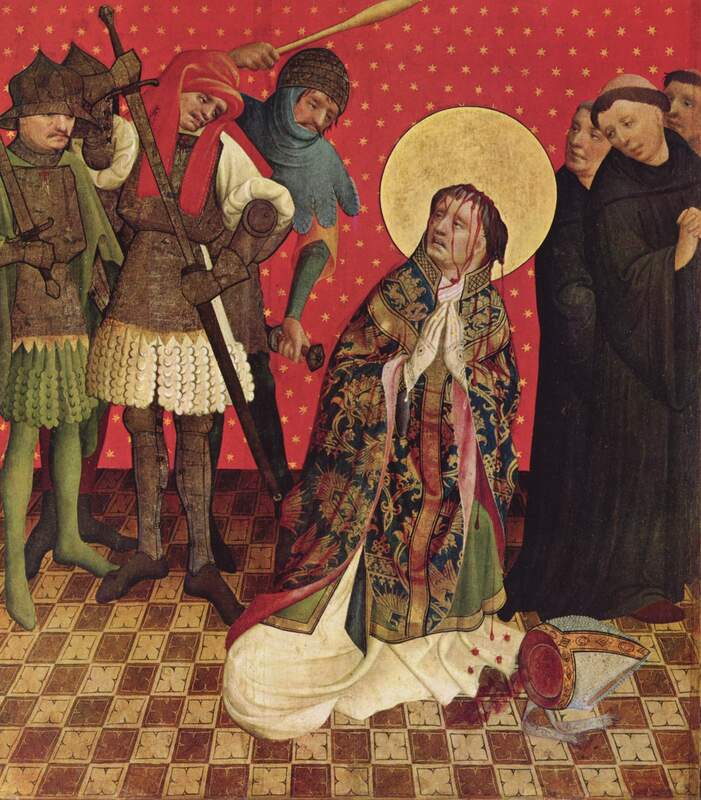 Today marks the feast day of St. Thomas Becket, bishop and martyr. Thomas was born c.1119 in Cheapside, London, on 21 December, the feast day of St. Thomas the Apostle, and died as a martyr in Canterbury Cathedral, 29 December 1170), as we can see from Wikipedia. Eventually, Thomas was made archbishpp of Canterbury in 1162, most likely because the king thought he would get ‘his own man’ in the Church. But Thomas took his appointment quite seriously and his “famous transformation … into an ascetic occurred at this time” (Wikipedia). He laid down his office as Lord Chancellor and said of himself, “From a patron of actors and a follower of hounds, I was made pastor of so many souls.” Thomas eventually became a burden for the king, partly because he pushed for the right of the Church, and the king is supposed to have said to his court, “Who will rid me of this turbulent priest?” (though there’s no record of him saying this). Because of his commitment to his post, and his conflicts with the Crown, Thomas was murdered. This was most likely not the king’s purpose, but four knights – Reginald Fitzurse, William de Tracy, Hugh de Morville, and Richard le Breton – took the king’s alleged question seriously and went to Canterbury Cathedral om 29 Desember 1170 where they murdered Thomas as he was praying vespers. 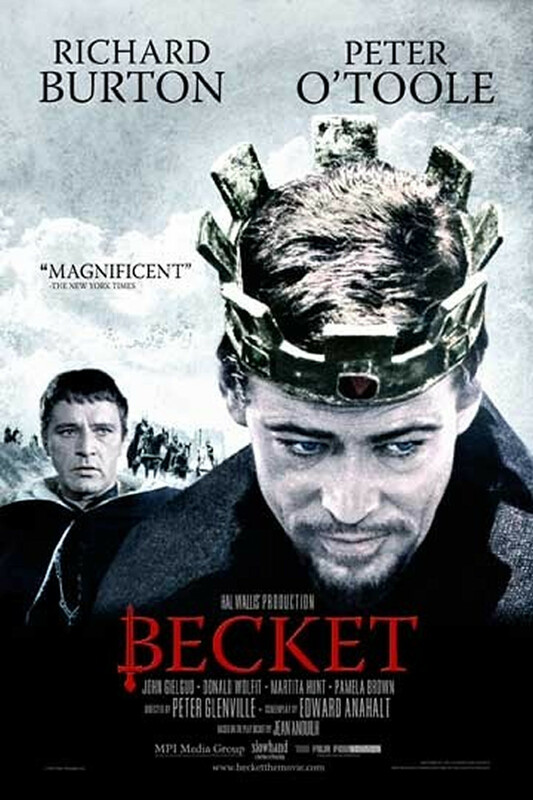 Poster for the movie Becket (1964). Today I plan to pray vespers in his memory, and I plan to watch the excellent movie Becket, though it is not entirely historically accurate. It claims that Thomas was a Saxon, and it portrays him and the king as roughly the same age (and as almost buddies). In reality, Thomas was 14 years older than the king. The picture here is the poster or DVD cover. St. Thomas Becket, pray for us! See The Lives of Thomas Becket. Selected sources translated and annotated by Michael Staunton (Manchester: Manchester University Press, 2001), 97. This is a prayer taken from the Roman Missal. See here. I went to Choral Evensong at Durham Cathedral a few days ago. It was very beautiful, sure, but I felt that the choir stole the whole service from me, including – horribly enough – the Lord’s prayer(!) and the Magnificat (which just feels weird to take away from the people, considering its content). Here is the order that was used, from the Book of Common Prayer. Of that we got to say exactly two things; the Creed and the grace at the end. I can (sort of but not really) understand that the choir sings the Biblical psalms. But just about every response? I felt unwelcome and alienated. I felt that it wouldn’t have mattered one bit whether or not I was there. And that is not a feeling you want to have in Church. I felt like I was at a concert, not a prayer. I have prayed vespers for years and I came to evensong to pray the service, and I was denied that. * There wasn’t a single hymn to sing either, and the anthem was of course also the prerogative of the choir for some reason. Suffice it to say that I probably won’t be back for another evensong at the cathedral. I’ll prefer to actual be allowed to pray vespers when I’m at vespers. It’s not supposed to be a show or a prerogative for ‘professionals.’ It is the prayers of the people but it felt like the prayers of an elite. * Well, almost. As the choir sang the psalms and responses I didn’t listen. I said them myself, out loud. Well, not loud per se, but in a low voice. I was there to pray, I wasn’t there to listen to Palestrina. I am very often called a ‘Protestant,’ mainly by American Evangelicals, Pentecostals, or Roman Catholics. But I have always rejected the term, and that is often perplexing to them. Since I am now a bit tired of explaining why, I have decided, after being encouraged, to just write a post about it. Some (and mainly Americans) claim that ‘Protestantism’ (as it is often used these days) is, in some sense, a result of the Reformation. Baptists, for instance, who are undeniable part of so called modern ‘Protestantism,’ have their origin in the Anabaptist and radical reformations, yet these predates the Lutheran Reformation and are condemned by name in Confessio Augustana, art. 5, 9, 12, 16 and 17. These are ‘Protestants’ in the modern sense, yet to say that they are a result of the Reformation is, well, undeniably wrong, as they are condemned by it, and would therefore have to exist before or concurrent with it. Some (American) Lutherans claim that “Lutherans were the original Protestants,” yet that is true only of German Lutherans in the Holy Roman Empire and perhaps their successors, yet I would say that this is dubious, as the term ‘Protestant’ is NOT, and have never been, a theological designation. It is a purely historical designation, and in its time it was political, not theological. The origin of the name ‘Protestant’ was a protest not against any church body (so not against the Roman Catholic Church) but against the Holy Roman Emperor’s enforcement of the Edict of the Second Diet of Speyer in 1529, upholding the condemnation of Luther and Lutheranism in the Empire from 1521 (the Edict of Worms) and reversing concessions made to Lutherans at the first Diet of Speyer in 1526. Read more at Wikipedia, and in the included links. This decision was met by protest (hence the term ‘Protestant’) from “six princes of the Holy Roman Empire and rulers of fourteen Imperial Free Cities,” according to Wikipedia. They didn’t protest the Catholic Church but the Holy Roman Empire, and the term wasn’t theological, it was political. It was a protest against the religious politics of the Holy Roman Emperor (to use more modern terminology). To use a modern equivalent, both Lutherans and Roman Catholics in the US are ‘Protestants’ in the historic sense when they protested the HHS Mandate. The Wikipedia article notes: “During the Reformation, the term protestant was hardly used outside of German politics. People who were involved in the religious movement used the word evangelical (German: evangelisch).” Later, and gradually, the article notes, “protestant became a general term, meaning any adherent of the Reformation in the German-speaking area.” Note when it says that it was a general term it was general in the German-speaking area, and not in Lutheranism as such. It was, and remains, a political term, confined to the German situation. It is understandable that many American Lutherans call themselves ‘Protestants’ (and underline that “Lutherans were the original Protestants”), as German Lutheranism has had a strong influence on American Lutheranism, more so, it seems, than Scandinavian Lutheranism (which is to be expected, the population of Germany far outnumbering the population of Scandinavia). Scandinavian Lutherans did not call themselves ‘Protstants,’ and I never will call myself that. In Norway we generally call ourselves ‘Lutheran’ or ‘evangelical Lutheran’ (no. evangelisk, not to be confused by the Norwegian evangelikal, used of the modern Evangelical Protestants) or often simply ‘Christians,’ though I find that to often be misleading. If someone asks me what I am, I don’t say simply ‘Christian,’ as I do not want to be put in the same box as Reformed, Baptists, Evangelicals, Pentecostals, and Charismatics. I would rather be mistaken for a Roman Catholic than for an Evangelical. Scandinavia was never part of the Holy Roman Empire and as such the edicts mentioned didn’t apply to us. Historically, no Scandinavian Lutherans called themselves ‘Protestants,’ and it is an entirely historically contingent term. In fact, in Scandinavia we had the reverse. Here, the Reformation wasn’t ground up, as in Germany, but top-down, as in England, introduced by the rulers (though the process was more ‘ecclesially willed’ in Sweden, then in Denmark-Norway, AFAIK). So the ‘Protestants’ in Scandinavia were Roman Catholics protesting the religious politics of the King (Gustav I in the Swedish Empire, Christian III in Denmark-Norway). So the historical designation ‘Protestant’ doesn’t refer to me, or to many Lutherans, therefore ‘Lutherans were the original Protestants’ is simply not true of Lutheranism as such, only of German Lutheranism (and, arguably, only for those six princes of the Holy Roman Empire and rulers of fourteen Imperial Free Cities, and their subjects, who uttered their political protest against the religious politics of the Holy Roman Emperor). But what about the more modern use of the word ‘Protestant’? Well, that is even more problematic. Many today simply say ‘Protestant’ every time they speak of a Christian who isn’t Roman Catholic, Eastern Orthodox, or Oriental Orthodox (or perhaps Old Catholic, if they know of their existence). But that means that it has become utterly useless as a term. It doesn’t say anything about what we believe, only who we aren’t subject to. It doesn’t tell you anything about the person who is given the title. It just tells you what he isn’t. I know Lutherans (especially Americans) who time and time again has to explain that yes, they do believe in the real presence or yes, they have liturgy, because they get lumped together with everything from Pentecostals to Adventists. When Anabaptists, who are opposed to the Lutheran Reformation, are called ‘Protestants,’ we see that it has lost its meaning. So to with the word ‘Protestant’ (as many use it). I have fare more – theologically, liturgically, sacramentally, and ecclesially – in common with Roman Catholics, Eastern Orthodox, Oriental Orthodox and Old Catholics than I have with Evangelicals, Pentecostals, Baptists, etc. To use the same kind of sentence, I would have to say, “As a Protestant, I have far more in common with Roman Catholics than I have with Protestants.” It shows how useless the term is. But it goes beyond this. To use a word – ‘Protestant’ – to denoted some kind of unity between me and these ‘Protestants’ over and against Roman Catholics, Eastern Orthodox, Oriental Orthodox and Old Catholics isn’t just useless and bizarre, it is misleading and, quite frankly, deceitful. It makes it look like there is some kind of unity between these so-called ‘Protestants,’ when, quite frankly, no such unity exists. It thus serves to cover up the fact that there is more unity between Lutherans and Roman Catholics, Eastern Orthodox, Oriental Orthodox and Old Catholics than there has ever been between Lutherans and, say, Evangelicals, Pentecostals or Baptists. To use ‘Protestant’ in this modern sense is basically to lie and deceive. A while back I talked to a fellow Lutheran priest and and we talked, amongst other things, about some traditional differences between Lutheran and Roman Catholic views on our relation to Christ, and about the difference between imitatio Christi, which is a traditional emphasis in Roman Catholic theology, with an emphasis on our imitation of Christ (cf. Philippians 2:5, 1. Peter 2:18-25), and conformitas Christi, which is a traditional emphasis in Lutheran theology, and particularily in Luther’s own though, with an emphasis on our conformity to Christ (cf. Romans 8:28-30). I believe that those two concepts are both very important, but I also believe that something is lost when we see them in a kind of duality. I do agree with most Lutheran theologians that conformitas Christi is ‘more important’ than imitatio Christi, where the second follows from, or flows forth from, the first, but I don’t think that we will really grasp them until we stop viewing them dually, and start to see both, in their proper relation, as following from, and being based on, the more basic notion of participatio Christi. Participatio Christi is often seen as an aspect of conformitas Christi, but I don’t agree with that. We partake of Christ, logically speaking, before we are conformed to him, conformed to his image. The former is given us directly, through faith, in baptism, where Christ is truly present in the believer and the believer truly partakes of him, and the latter is a process through which God ‘molds’ us; forms us in, or conforms us to, the image of his Son (Romans 8:28-30). In fact, I believe that this notion is at the heart of theology, and it is one of the main elements of my Lutheran defence of the Eucharistic sacrifice. When we properly understand our relation to Christ, through the hypostatic union, and expressed in (the Lutheran understandig of) the doctrine of the communicatio idiomatum, we see that it all boils down to this: Undeservedly, by grace, we are justified and made children of God, partakers of Christ, which, through the working of God, conforms us more and more to Christ, and which, again through the working of God, produces in us an imitation of Christ or what Christ and St. Paul calls ‘fruit.’ Note the important part of that image. No tree can force fruit to come. If the tree is good, and if it is well ‘fed,’ it will produce fruit. And we cannot produce fruit, says Christ, unless we are in him (John 15). He is the true vine, we are the branches, having been grafted into him. When people argue what is more important; conformity to Christ or imitation of him, I say that they are both crucially important but must be understood in their proper relation to each other and, more importantly, to the more basic notion of our participation on him. Without that as the starting point, it all collapses and we end up emphasising ourselves (either inwardly or outwardly) instead of Him. For some points about this read Per Lønning, «Conformitas Christi,» in Lønning, The Dilemma of Contemporary Theology: Prefigured in Luther, Pascal, Kierkegaard, Nietzsche (Oslo: Universitetsforlaget 1962): 9-26, and Bård Norheim, Practicing Baptism: Christian Practices and the Presence of Christ (Eugene, OR: Pickwick Publications 2014): 104-106, 160-162, 174-176. For some ideas on this, see Union with Christ: The New Finnish Interpretation of Luther, eds., Carl E. Braaten & Robert W. Jenson (Grand Rapids, MI: Eerdmans 1998). See «“Do this in remembrance of me … ” A Lutheran defense of the Sacrifice of the Mass,» which is the accepted manuscript of an article of mine published by Taylor & Francis in Studia Theologica: Nordic Journal of Theology on May 8, 2017. See esp. Johann Anselm Steiger, «The communicatio idiomatum as the Axle and Motor of Luther’s Theology» (Lutheran Quarterly 14, 2000): 125-158 and Vidar Haanes, «Christological Themes in Luther’s Theology» (Studia Theologica 61, 2007): 21-46 (esp. pp.30-33).